Is your summer garden bursting at the seams with fresh zucchini? Make this recipe for Crock-Pot Fresh Zucchini Casserole to use up some of that garden (or farmer’s market) abundance. Full of healthy vegetables and taste great this easy slow cooker recipe is a winner every time! It’s the time of year….fresh veggies from the garden! It’s also that time of year where you have a plethora of zucchini and squash and need a recipe to use them up before your inundated on your counter with them. This recipe for Crock-Pot Fresh Zucchini Casserole is super easy to make if your needing such a recipe! This casserole is filled with yummy vegetables, a creamy sauce and then topped with a crispy crust made from stuffing mix (like Stove Top Savory Herb) and it is just delicious. You can serve this as a meatless main dish (we did!) or as a side dish. It is a great recipe to use up that abundance of zucchini from the garden and I hope you will enjoy! In one large bowl, you will combine, zucchini, squash, onion, carrots and soup. Melt the sour cream on 50% power on your microwave just enough for it to soften. Combine the sour cream and flour in a small bowl and then add it to the veggies. In another bowl mix the melted butter with the stuffing mix. I used a liner in the crock and sprayed with Pam. Then place half of the stuffing mix into the bottom of the crock. Then add the vegetable, soup mixture. On the top add the remaining crumbs. You can switch out the Cream of Celery with Cream of Chicken if you prefer. Delicious family, comfort meal! Thanks for coming and linking up at The Weekend Social. Please be sure to come back next week starting Thursdays at 9PM EST on culinaryflavors.gr ! I hope to see you there! What about the onion? When do you add the onion? To the vegie mixture or the stuffing mixture? Onions with the rest of the veggies. I fixed the recipe. Thank you! Yummy! Trying to pin but getting message that says image is not valid. Any suggestions? Love your ladies’ blog and glad to be a new follower! I would love to make this but I need to make it gluten fee.. would rice flour be ok to use or is there a better choice .. I know there Gluten free but rice flour is much cheaper. Hi Shalon, We have not tested this recipe using rice flour. If you give it a try be sure to let us know how it turns out for you! Shalon I’ve not used rice flour before, but I have used both Parmesan chips ground up and pork rinds ground up to use in place of bread crumbs so it would be gluten free. 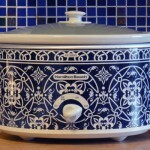 I also love my crockpots. I look for the appliances at ebay because I much prefer the older models with just the three settings of WARM, LOW and HIGH.